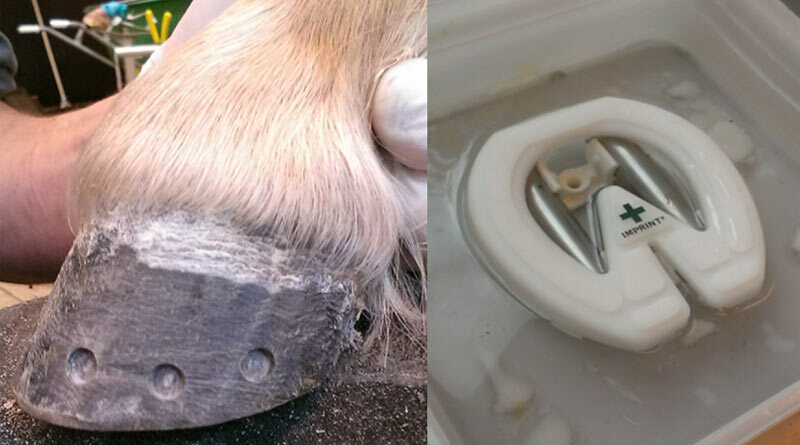 The process of applying the mouldable shoes: Left, six superficial indentations are drilled in the dorsal hoof wall to increase the contact area between the hoof wall and the mouldable plastic. This is followed by the application of an adhesive glue to the hoof wall. Right, the upper rim of the shoe becomes mouldable after it has been emerged in boiling water. Thermoplastic, glue-on frog-support shoes were found to improve the gait and perceived comfort in obese ponies in a study in the Netherlands. The research, carried out by a team led by Janneke Sleutjens at Utrecht University Department of Equine Sciences, studied hoof kinetics in a group of 10 Shetland ponies from the university’s research herd both before and after application of the frog-supportive mouldable glue-on shoe (Imprint First shoe). The shoes tested have been developed to support the feet in horses with acute laminitis. The proposed theory behind the shoe is that, owing to the heart bar shape, the palmar structures of the hoof contribute to the weightbearing surface and the rolled toe should ease breakover. Ten Shetland mares were divided into two groups of five; normal weight and obese. All were given a routine foot trim by university farrier Jan de Zwaan. The ponies were led at walk and trot over a force plate and dynamically calibrated pressure plate immediately following trimming and again 72 hours after the application of the thermo-plastic Imprint First shoes. Whilst the normal weight ponies moved more smoothly and evenly, the obese, hyperinsulinaemic, ponies were noted to move more ‘carefully’ by demonstrating a shorter stride and stance phase and increased loading of the heel region compared with the toe at both walk and trot – discomfort commonly associated with a sub clinical stage of laminitis. Left, the correct size frog-supportive shoe is fitted on the foot. Right: The mouldable thermoplastic hardens within minutes with the application of a freezer spray. The normal ponies did not show a significant change of gait in response to the frog-support shoes. However, application of the shoes had an immediate effect on the obese ponies. Their gait improved, with less heel landing and a longer stride and stance phase. The obese ponies gait improved further during the following 72 hrs and became more fluent and comfortable like the normal weighted ponies. The research team conclude that frog-support shoes could be beneficial, especially for obese ponies. Andrew Poynton FWCF, Managing Director of Imprint Equine Foot Care, said the shoe provides maximum support from its heart-bar design whilst still allowing natural movement of the foot. He said it was the only mouldable shoe designed specifically for the early treatment of laminitis.